Governments around the world are grappling with how to tackle rising rates of obesity. Reducing consumption of junk food is central to this, because junk food is high in calories, salt, sugar and fat, and low in fibre, proteins and vitamins. Junk food markets, such as those for confectionery, soda and potato crisps, share common features. They tend to be dominated by a small number of firms, selling multiple brands, and advertising their products heavily. Policy organisations including WHO, expecting that less junk food advertising will translate into less junk food eating, have called for advertising restrictions on junk food. The ways in which advertising affects consumer choice, and how firms respond to an advertising ban, would determine whether advertising would have this effect. The size of the impact would depend on how much advertising for a brand stimulates demand for other brands, and whether the overall effect would be to enlarge or shrink the size of the market. It would also depend on whether advertising makes demand more or less sensitive to price, and whether firms that sell junk food respond to restrictions strategically – for instance, by lowering prices. In a recent paper, we estimate how demand for different brands of crisps were affected by advertising (Dubois et al. 2017). We use the estimates to simulate the impact of banning advertising, considering both the consumer response and what would happen if firms changed their prices. Economists have long been interested in the mechanism through which advertising affects consumer choice. There are three broad traditions. Chamberlin (1933) argued that, on one hand, advertising may play a persuasive role in altering consumer tastes, and on the other, it may play an informative role in conveying information to consumers about a product’s existence, price or quality. A third view of advertising (advanced by, among others, Becker and Murphy 1993) considers it as directly entering consumer utility as a complement to the advertised good. These alternative views have different positive and normative implications. 'Persuasive' theories argue that advertising making demand less elastic, distorting consumer decision-making. 'Informative' theories suggest that advertising helps consumers overcome costly search. The 'complementary' view highlights how advertising can enhance the value of a good by, for example, improving the social prestige associated with its consumption. To assess the impact of banning advertising on consumer switching, prices and health empirically, it is important to use a model that accommodates all the ways that advertising might alter the shape of demand. This can be done while remaining agnostic about how advertising affects consumer utility – for instance, persuasive and complementary advertising can have empirically indistinguishable effects on consumer demand. To make statements about the impact on consumer welfare, however, we need to take a more definitive view. It is challenging to obtain robust empirical estimates of the causal effects of advertising on consumer choice (e.g. Lewis and Rao 2015). We exploit variation in the extent to which individuals were exposed to advertising of crisps over time. To do this, we use variation that arose due to the time and station that different brands of crisp were advertised, and the TV viewing behaviour of individuals. We have panel data on purchases that allow us to control for a number of potentially confounding factors, such as time-varying demographic-specific fluctuations in brand demand. Often econometric models of consumer choice place restrictions on the signs of switching patterns across products. Most of the time, this is not controversial – for instance, an increase in the price of brand A is unlikely to lead to a fall in demand of brand B. In the case of advertising effects, however, it is important not to impose sign restrictions. Brand advertising may be predatory, in which case its effect is to take market share from rival products, or it might be cooperative, so that an increase in the advertising for one product increases demand for other products (Friedman 1983). Our demand specification allowed for the possibility that advertising was either predatory, cooperative or both. We also allowed for the possibility that advertising impacts on demand both now and in the future. People are unlikely to instantly forget adverts they see, so this is potentially important (and turns out to be important empirically). It does make modelling the supply side of the market more complicated however, since a firm’s advertising choice will affect both the current and all future profits of every firm in the market. This means that, when firms choose their advertising strategies, they play a complicated dynamic game. Our interest is in assessing the impacts of an advertising ban however, which conveniently means that we do not need to worry about the precise details of firm advertising choices. We model firm price-setting, which allows us to capture how firms would respond to the advertising ban in terms of the prices they set. Our estimates show that advertising has rich effects on consumer demand. Advertising lowers the willingness of consumers to pay for an increase in the healthiness of crisps. It also lowers the price sensitivity of demand and encourages people to switch to larger pack sizes. We found evidence of both predatory and cooperative advertising. Overall, advertising expands the size of the market. We estimated that if advertising were banned and firms did not respond by changing prices the total quantity of crisps sold would fall by around 15% – leading to similar falls in energy, saturated fat and salt from crisps. These health gains would be partially mitigated by people switching to other junk food (confectionery, for example), and we found that switching to other junk foods would be stronger than towards healthy snacks. Firms would face incentives to change their prices following any advertising ban. Advertising makes demand less elastic, so that banning it raises the sensitivity of demand to prices, and so firms to lower their prices. This is intuitive: banning competition in advertising intensifies competition in prices. The response of firms to the ban acts to offset the reduction in potato chip demand that results directly from the absence of advertising. Prices in the market fall by 4% on average, and therefore in equilibrium the effect of the advertising ban is to lower demand for potato chips by around 10% – two-thirds the reduction if prices were held constant. Our study shows that banning crisp advertising would lead to health gains from lower consumption, once we take account the complex ways advertising can affect demand, and the pricing response of firms in the market. These health gains will be limited for two reasons. First, some firms would respond to the ban by lowering prices, which leads to an offsetting increase in the demand for crisps. Second, some consumers would substitute to other junk foods. Our analysis relies on carefully modelling the channels by which advertising can influence consumer demands. To take the analysis further and make welfare statements, we need to be more precise about whether advertising is persuasive, informative or complementary. 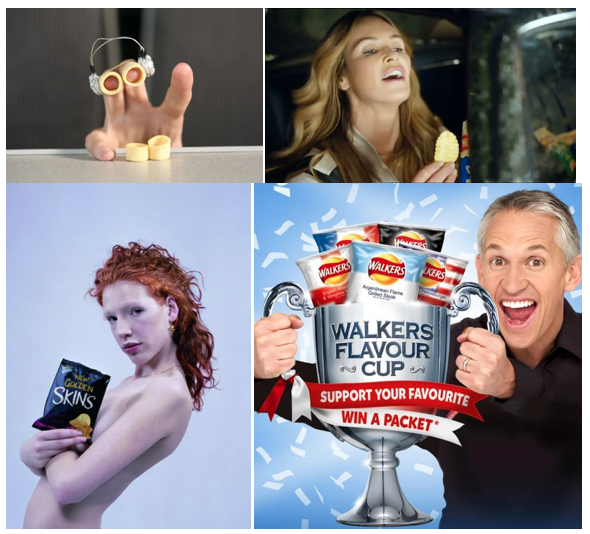 Below, we show some example crisp adverts – we leave it to the reader to decide which type of advertising these are. Bernheim and Rangel (2009) argue that advertising provides environmental cues that lead consumers to behave like non-standard decision-makers and that “choices made in the presence of those cues are therefore predicated on improperly processed information, and welfare evaluations should be guided by choices made under other conditions.” If we accept this persuasive view, then banning advertising would improve consumer welfare for two reasons. Banning advertising would remove a distortion to decision-making, and would also lower prices. This welfare gain would be greater than the fall in firms’ profits resulting from the ban. Of course, the long-run welfare impacts of banning advertising would also depend on future savings of the public cost of healthcare. Becker, G S and K M Murphy (1993), “A Simple Theory of Advertising as a Good or Ban”, Quarterly Journal of Economics 108(4), 941-964. Bernheim, B and A Rangel (2005), “Behavioral public economics welfare and policy analysis with non-standard decision-makers”, Technical Report 11518, NBER Working Paper. Chamberlin, E (1933), The Theory of Monopolistic Competition. Harvard University Press: Cambridge, MA. Dubois, P, R Griffith and M O’Connell (2007), “The Effects of Banning Advertising in Junk Food Markets”, forthcoming in Review of Economic Studies. Friedman, J (1983), “Advertising and Oligopolistic Equilibrium”, Bell Journal of Economics 14, 461-473. Lewis, R A and J M Rao (2015), “The unfavorable economics of measuring the returns to advertising”, Quarterly Journal of Economics 140, 1941-1973.